Space allocation for various products is a strategically pre-planned process. So, in order to allocate space to new products, merchandisers need to struggle a lot. This, in turn, leads to limited strategic planning and dissatisfactory store performance. Thus, the retail stores end up finding themselves much behind the competitors. 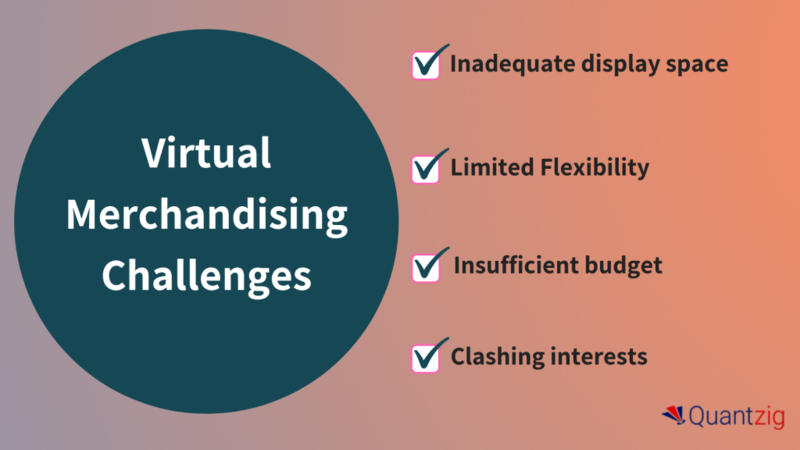 Limited flexibility is one of the most important challenges that every small retailer faces in visual merchandising. Competing suppliers always want their goods to be displayed at the front of the store. Furthermore, products that are huge, require and engage a considerable amount of space. Such products need a considerable amount of space that catches customer’s attention from all angles. Moreover, there is difficulty in creating flexibility with large merchandise like electric appliances, furniture, and home décor products. This impacts the merchandising efforts significantly. When it comes to devising and executing a successful visual merchandising strategy, retailers tend to focus and invest less. This is done to cut cost and maximize profits. But most retailers fail to understand that they don’t always need a huge budget to attain success at visual merchandising. If you have a proper strategy in place, even limited budgets can help yield positive results. Conflicting interests of visual merchandisers, top management, and staff can pose a big threat in visual merchandising. In most cases, top management and the supplier predetermine the decision as to where products are displayed. Furthermore, sometimes, what seems appropriate to the visual merchandiser could be tough for the sales staff to implement. These conflicts in interests result in a lack of cooperation and coordination in retail stores and ultimately a failed visual merchandising strategy. Having years of expertise in merchandising analytics solutions, Quantzig help retail companies and merchandisers to make informed decisions daily, both at tactical and strategic levels. Also, our solutions help businesses optimize store-front layout and merchandise assortment, optimize promotions and markdowns, track new product performance, and boost profit margins. Our solutions offer relevant information for strategic planning to improve the performance of the store. With an experienced team of certified data specialists, Quantzig’s merchandising analytics solutions help businesses optimize their in-store operations based on the buying patterns of customers and empowers marketers to identify marketing opportunities that will achieve the maximum ROI. Are you facing any of these visual merchandising challenges or want to gain actionable insights into our category planning and merchandising operations? Contact us now!